US Road Trip Day 16 – Best Friends and Rocking V | Where's my backpack? The tent was like a sauna about five minutes after sunrise, because in our haste to get set up before the storm broke the night before, we’d managed to pitch in the only spot where there was zero shade. It was blissfully cool when I emerged from the confines of the canvas and took in our surroundings. 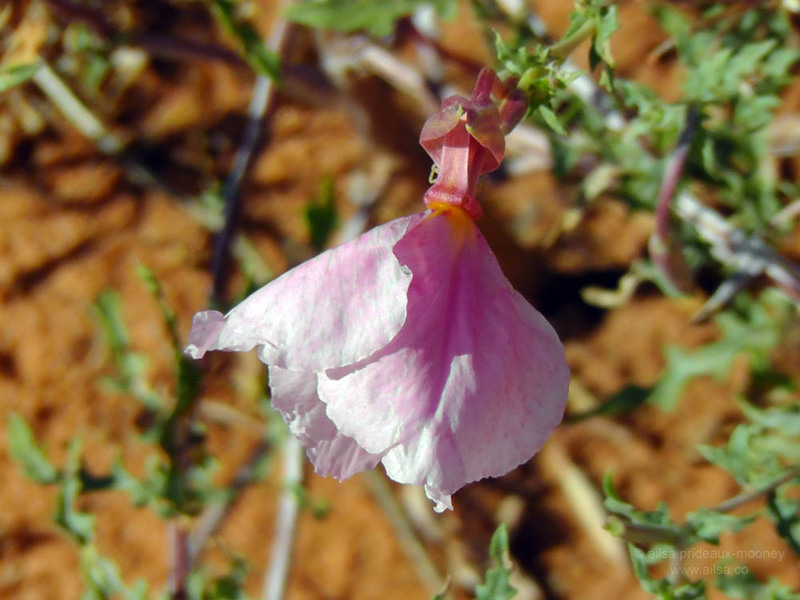 Tiny, delicately pale desert flowers were blooming on the floor of the Coral Pink Sand Dunes and made me forget all about the perilous creatures that might have been lurking with intent to dramatically shorten my lifespan. Jill boiled water for coffee and we sat and planned our day, deciding to stay at the campsite another night. We were way behind schedule but were too exhausted to care; the idea of looking for another site a little further along the road after a full day at Best Friends Animal Society didn’t sound too appealing. On our way out we stopped by the ranger station and booked for another night, leaving our tent pitched so we could just roll back in later without a worry. 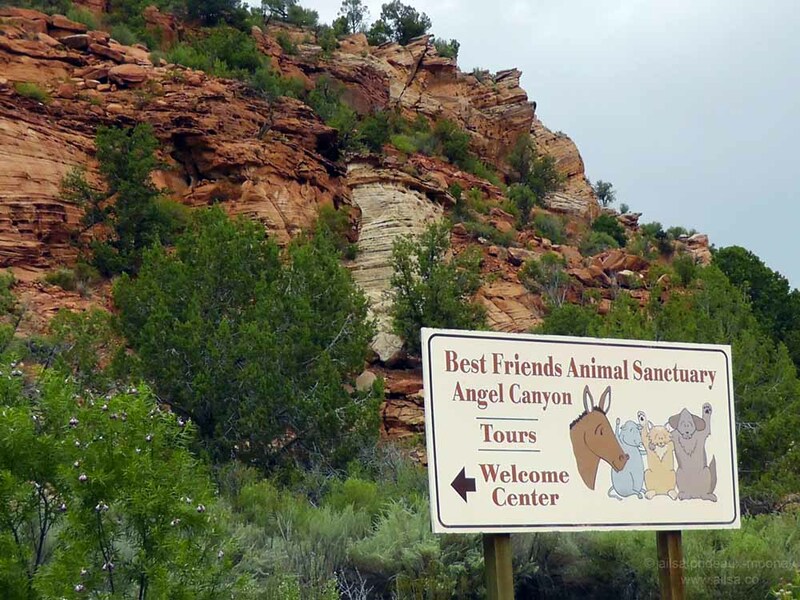 It was a short drive to Best Friends, the nation’s largest no-kill animal shelter located just outside Kanab in Kanab Canyon, now commonly referred to as Angel Canyon. The sanctuary is situated on 3,700 acres with an additional 30,000 acres leased from the federal government. We pulled into the parking lot and made our way to the welcome centre through a flower-filled garden complete with koi pond and outdoor patio. Jill had signed up to do a volunteer shift, so she was whisked away to an orientation, allowing me a little time to explore the grounds before joining in a guided tour of the premises. The tour started with a brief introductory video about the work of Best Friends, talking about their adoption and spay and neuter programs, as well as their lobbying work. Then we were driven through a small part of their extensive sanctuary in one of their buses. 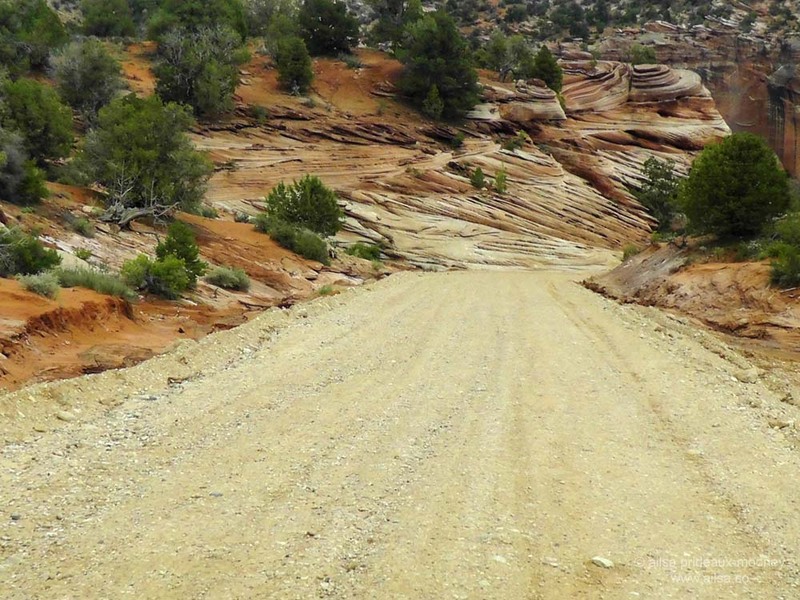 The previous night’s storm had prevented earlier tours from taking the road through Angel Canyon, but luckily things had dried up enough for us to be the first group that day to travel along the dusty trail that wound through the canyon. 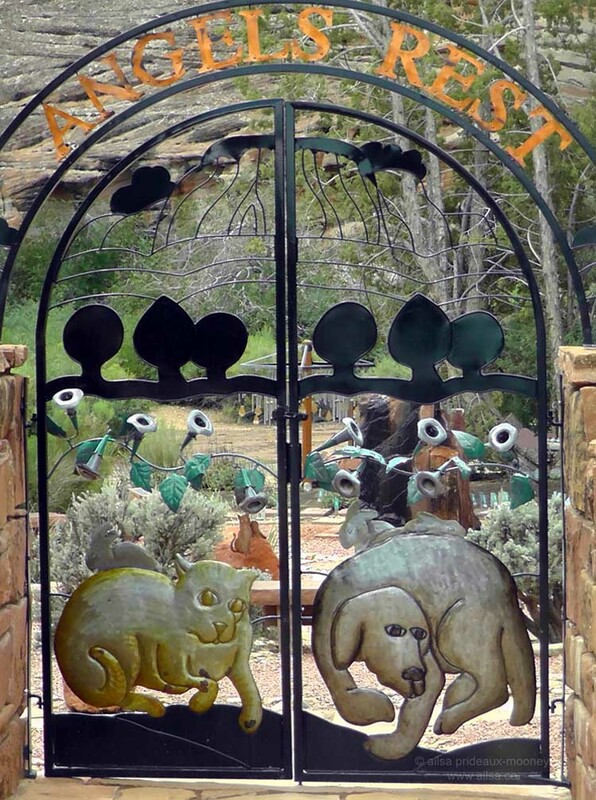 Signposts pointed the way to Parrot Garden, Bunny House, Wild Friends and many other sections of this vast sanctuary. On any given day, Best Friends is home to 1,700 animals, including pigs, sheep, horses, cats, dogs and birds. While their tag line reads ‘No More Homeless Pets’ their mission is much further reaching, to include education and outreach, wildlife rescue and rehabilitation, and lobbying against puppy mills and breed specific legislation. We stopped off at Dogtown and Cat World along the way to see some of the current residents at play and talk with some of the staff about their work at the sanctuary. 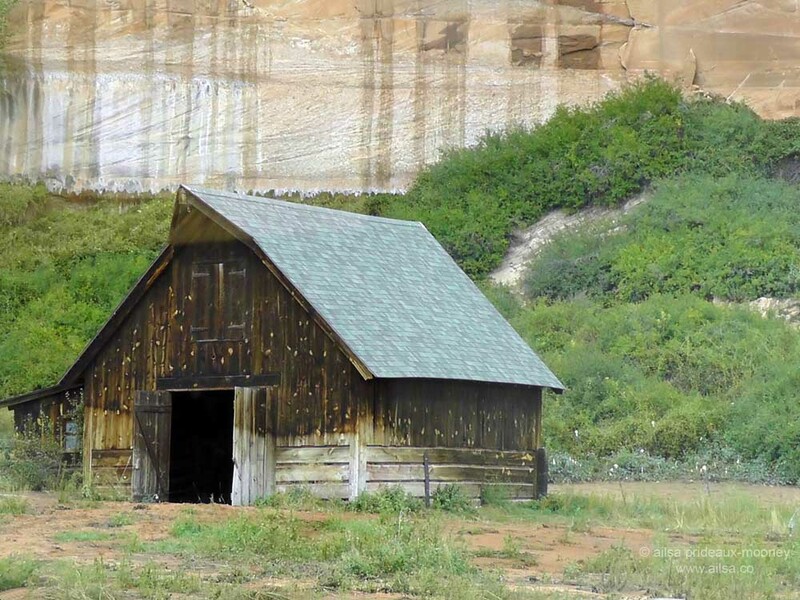 The road back brought us by the so-called Disney Barn, a stage set left over from the filming of ‘One Little Indian’; ‘The Outlaw Josey Wales’ was also filmed in this neck of the woods. Our final stop of the day was Angels Rest, a pet memorial park filled with wind chimes, a gently babbling fountain and a labyrinth walk. There’s even a little section called Angels Nest for the smaller members of the animal kingdom such as mice and birds. Back at the welcome centre, I spent a little time watching hummingbirds whizz by on the patio before meeting up again with Jill. We swapped stories of our day, and then headed down towards Piggy Paradise and Horse Haven for a look around. As we wandered through the lower canyon, things were awkwardly stilted between us once again. I didn’t understand what was going on; one minute we were fine and the next minute our exchanges were curt and irritable. This had been happening on and off for the last five days of our road trip, as well as the lead up to it, and it was getting ridiculous. I threw up my hands in despair, literally – it was the first time I have ever consciously been aware of doing that; up until then it had only been a figure of speech. But there I was, in the middle of a canyon, throwing my arms up in the air and Jill saw me do it, and so our day of reckoning came, right then, right there. It was long overdue and entirely inevitable; something that was bound to happen when two dramatically different personalities try to undertake a long journey together. We squared off and called each other on every single thing that had been driving us crazy about the other. The most hysterical thing about the argument was that we were in the middle of a canyon, so any time we raised our voices above a whisper, the canyon echoed dolefully and we were interrupted by a horse whinnying, a sheep bleating or a pig grunting. So the entire squabble was conducted in hushed tones and while we mumbled our complaints in breathy whispers, we checked in with the little rescue animals around us to make sure we weren’t upsetting them. It was the most bizarre argument I’ve ever had, and also the most productive. We got all our issues resolved; it was quite brilliant. We stood there taking stock of the situation after we had finished and agreed this would make the ideal venue for couples therapy. Forget the therapist’s couch; just drop angst-ridden couples off in a canyon, tell them not to disturb the animals and leave them there until they figured things out. Our laughter echoed around the canyon as we said goodbye to the rescue animals and set off for downtown Kanab. We were looking for a coffee shop we had heard some of the locals mention, but couldn’t find it anywhere along the main street, so pulled in to the parking lot of what seemed to be a cafe and sat there in the truck talking. Jill opened up about what was causing her to be so distressed, having left a job she loved for a new position at another company that had turned out to be an extremely hostile environment and one of the most painful experiences she had ever had. She had ended up leaving, and was now trying to figure out her future and not finding any answers. Every time she started working on her resume, her mind raced ahead to what she really wanted to be doing in the future and it was driving her crazy, because while she was struggling with finding a career path, she and her husband were also thinking of starting a family, which is a game changer if ever there was one. We were both in floods of tears by the time we got out of the truck. Exhausted from talking and in need of a pick-me-up, we went into the Rocking V Cafe which wasn’t a coffee shop after all, but a delightful slow food restaurant with an art gallery upstairs. We asked if there was a coffee shop nearby and the owner, Victor, a New Yorker with a wicked sense of humour, told us of a couple of places, but then started making us laugh as he cajoled us to check out his restaurant instead. ‘Let’s stay for dinner, it’s on me’ Jill said, and so we grabbed a table by the window and let Victor entertain us over some seriously delicious food and delectable cocktails. 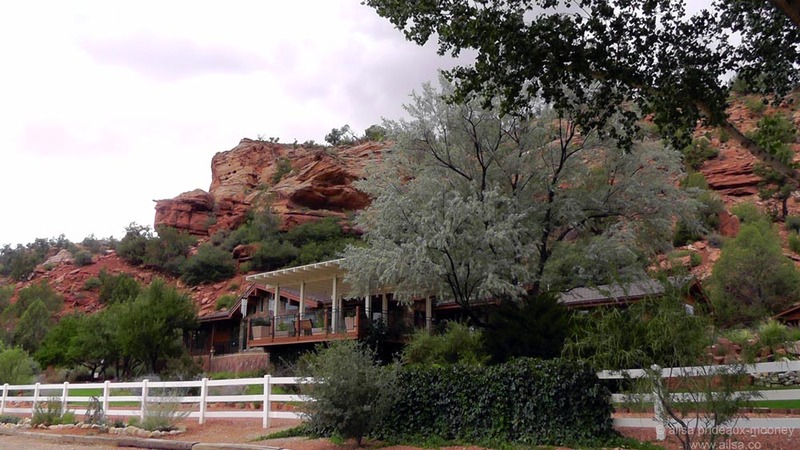 Victor and his wife Vicky used to work in television journalism but fell in love with this area after they got married in Zion National Park and when Kanab’s old General Mercantile building went up for sale, they decided to buy it and turn it into a restaurant. Victor is a nature lover after my own heart, an avid wildlife and landscape photographer, and we talked about some of the more elusive places to photograph in the Utah area, including the dramatic formations of the Subway and the Wave, both of which require permits and had me chomping at the bit to return with permits and camera in hand. Jill was flicking through some of his photos when she froze and shot a worried glance at me. ‘Don’t show Ailsa,’ she whispered to Victor, so obviously I had to look. It was a photograph of a giant rattlesnake with a caption underneath that read “Coral Pink Sand Dunes” – right where we were camping. Victor fixed me with an earnest gaze. “They hunt at night” he said and laughed heartily as I paled visibly and downed my drink in one gulp. After dinner we popped upstairs to the Rafter’s Gallery for a browse through the artwork on display and then took Victor up on his offer of a joyride around the block in his plug in electric car which was the perfect end to the evening. Back at the camp site I narrowly avoided another head on collision with the resident bat when I went to brush my teeth. Jill tumbled, screaming, into the bathroom after being trapped in the entryway with not one but two bats. It took us a good fifteen minutes to muster up enough courage to leave, giggling and squawking as the bats danced around us in a frenzy. It wasn’t until I was zipping up my sleeping bag that I remembered Victor’s photograph of the giant rattlesnake. I shoved my backpack between my face and the tent in the hopes it would protect me from the worst of a venomous snakebite as I slept. Cool shot of the hummingbird. Cheers! These are gorgeous photos. Esp love that barn! Nice work! So glad to hear you and Jill finally got things sorted out. That canyon does, indeed, sound like a great therapy location 🙂 Now about that rattlesnake…..
Hee hee, it certainly guaranteed me a restless night, Jennifer! Wow .. so cool! I want to visit Best Friends … they sound like an excellent organization, right up my alley! Speaking of excellent, great hummingbird shots! 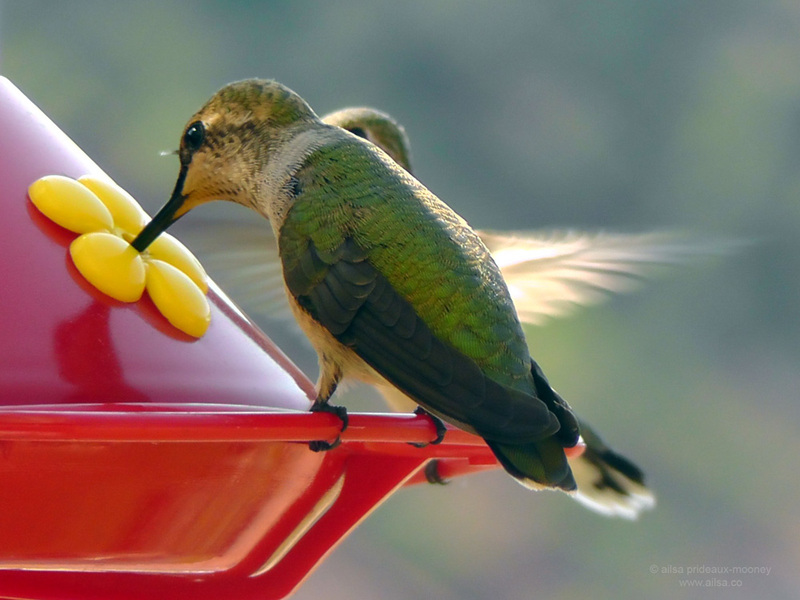 Amazing hummingbirds! So crisp n clear. How did u manage them? As always a great treat to read you thanks Ailsa. Me too, Margaret, Utah was amazing. AMAZING HUMMINGBIRD SHOT. You travel to some amazing places. I want to jump into your backpack. Love reading your stories and your photos are beautiful. 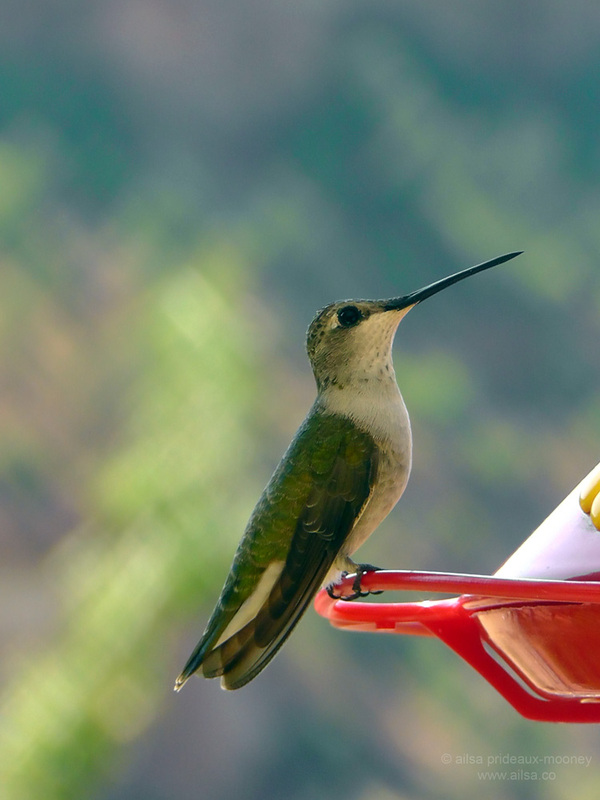 I especially love the photos of the hummingbirds (along with everyone else). Thank you for sharing. I love the clarity and color in these pictures … nicely done! Such fun reading of your travels. I’m itching to hit the road. 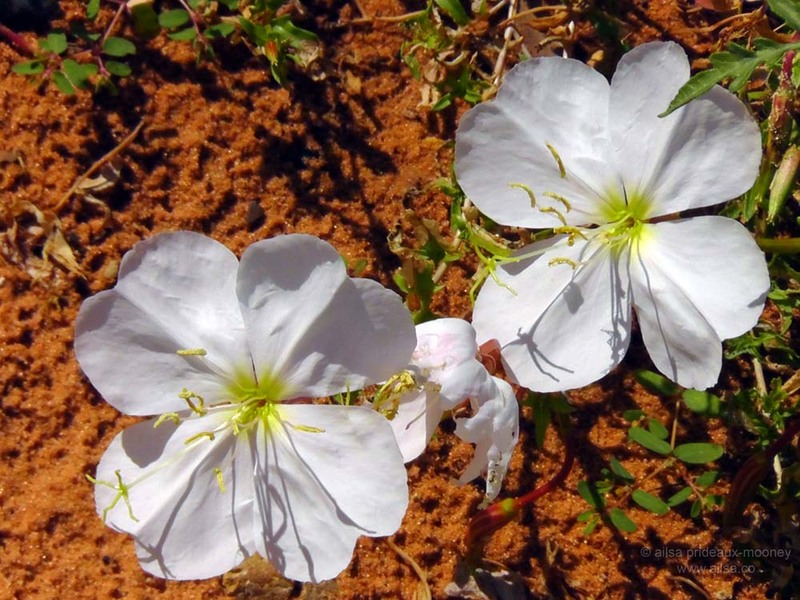 I am enjoying this trip and your photos are outstanding…. This is such good writing. I love it. Best Friends sounds an idyllic place. It solved your problems too 😉 Superb photos. Isn’t it great to have friends you can work things through on and still come out smiling? Fantastic photos and stories as always Ailsa, really enjoyable! Oh! I am so enjoying travelling with you – and Jill, of course – and so pleased you have both settled your differences. Yaay, thanks for the shout out, Pat, hope your ankle feels better soon. Some trip you have been … on! Amazing and you must have seen most of US by now. Your birds are stunningly beautiful. The crazy thing is, viveka, I’ve only seen a small part of the US and it feels like I’ve been travelling forever. There’s so much to see out there! I know .. and that is what I tell people that are so annoyed about that some Americans know so little about the rest of the world – you have so much going on at home and so much to see … there. Hi Alisa, what a beautiful, well-written post. 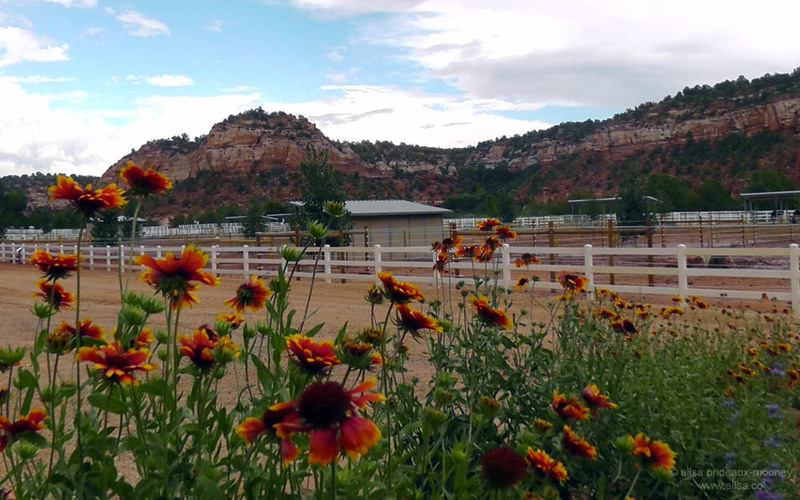 I am so glad I stumbled on it; I support Best Friends and would so love to see their sanctuary in Kanab, Utah. Thanks for painting a lovely picture of it for me. Oh, and the whispered argument in the canyon — with the rescue animals all around — made me laugh! I will…and that part of the trip makes for a great story! I enjoy your posts and photos. 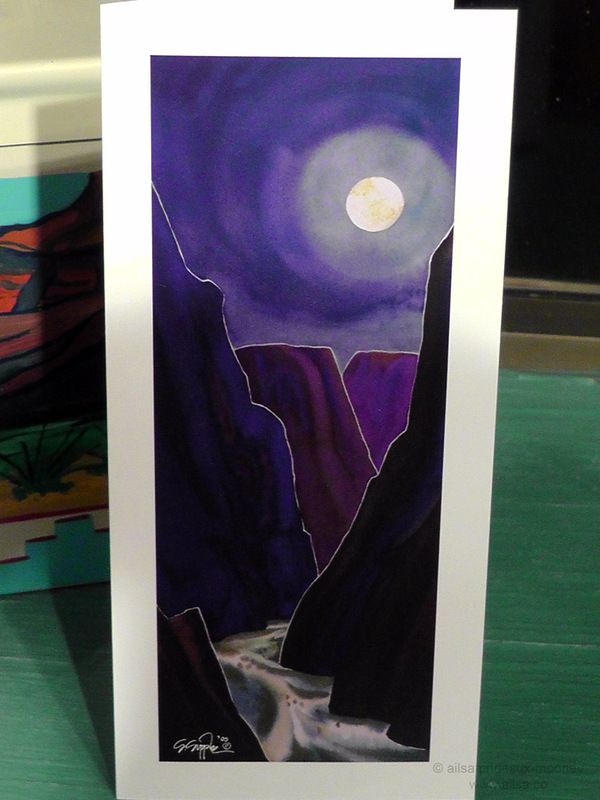 Love the canyon and the story. Love, love the photos! Not yet! It’s on my list. Have you read their book about the history of Best Friends? So inspirational. LOL … Love the fact that you were trying to hash out your “road trip frustrations” in the middle of the canyons and all you heard was echoing! Frankly, I am surprised you made it that long! . Some people don’t made it past day 3 with annoyance… It was all bottled up! … Love your landscapes! I wish I had some of these where I live! But… Not in Florida! Birds, yes. Beautiful landscapes, …. if you count the beaches and rare hiking tails with just a few different types of cypress oaks and palms, that’s another thing…! I’m glad you and Jill finally got to talk things out! I’ve never heard of you or your fantastic blog until this morning (after you were so gracious as to comment on my paltry entry.. thank you for that! )… and I had NO idea what I was missing! You’ve got THE most refreshingly human, entertaining and fascinating way of writing! I’ve positively eaten up this particular entry, in fact… and cannot wait to get a cup of coffee and peruse some more. What a blessed life for you, getting to travel, LIVE and write/photograph your experiences… and how blessed are we… your readers/followers.